Abstract. The difference due to the content of a priori information between a constrained retrieval and the true atmospheric state is usually represented by a diagnostic quantity called smoothing error. In this paper it is shown that, regardless of the usefulness of the smoothing error as a diagnostic tool in its own right, the concept of the smoothing error as a component of the retrieval error budget is questionable because it is not compliant with Gaussian error propagation. The reason for this is that the smoothing error does not represent the expected deviation of the retrieval from the true state but the expected deviation of the retrieval from the atmospheric state sampled on an arbitrary grid, which is itself a smoothed representation of the true state; in other words, to characterize the full loss of information with respect to the true atmosphere, the effect of the representation of the atmospheric state on a finite grid also needs to be considered. The idea of a sufficiently fine sampling of this reference atmospheric state is problematic because atmospheric variability occurs on all scales, implying that there is no limit beyond which the sampling is fine enough. Even the idealization of infinitesimally fine sampling of the reference state does not help, because the smoothing error is applied to quantities which are only defined in a statistical sense, which implies that a finite volume of sufficient spatial extent is needed to meaningfully discuss temperature or concentration. Smoothing differences, however, which play a role when measurements are compared, are still a useful quantity if the covariance matrix involved has been evaluated on the comparison grid rather than resulting from interpolation and if the averaging kernel matrices have been evaluated on a grid fine enough to capture all atmospheric variations that the instruments are sensitive to. This is, under the assumptions stated, because the undefined component of the smoothing error, which is the effect of smoothing implied by the finite grid on which the measurements are compared, cancels out when the difference is calculated. 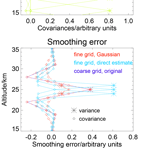 If the effect of a retrieval constraint is to be diagnosed on a grid finer than the native grid of the retrieval by means of the smoothing error, the latter must be evaluated directly on the fine grid, using an ensemble covariance matrix which includes all variability on the fine grid. 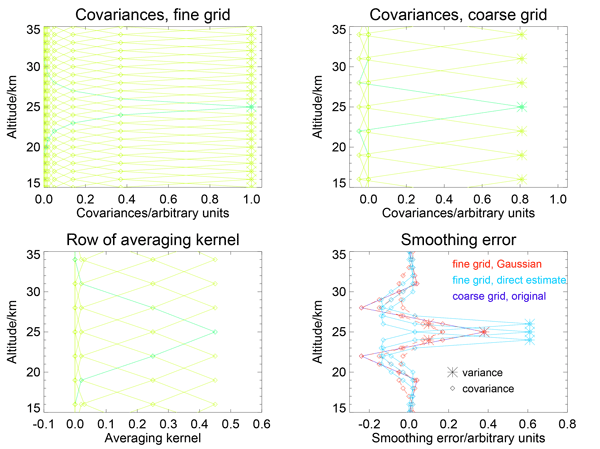 Ideally, the averaging kernels needed should be calculated directly on the finer grid, but if the grid of the original averaging kernels allows for representation of all the structures the instrument is sensitive to, then their interpolation can be an adequate approximation. How to cite: von Clarmann, T.: Smoothing error pitfalls, Atmos. Meas. Tech., 7, 3023-3034, https://doi.org/10.5194/amt-7-3023-2014, 2014.